Members of the Friends of Malaysia Club in Korea pose for camera with visiting Tourism Malaysia officials including Mr. Wan Zawawi Mohammed, director of North/East Asia Promotion Division (sixth from left) and Jon Kim (seventh from left), co-chairman of the Club. Mr.Wan Zawawi Mohammed, Director of North/East Asia Promotion Division of Tourism Malaysia has said that Malaysia is taking various measures, including upgrading the facilities of budget hotels, to make Malaysia as premier tourist destination for growing number of Korean visitors. In the year of 2007 known as Visit Malaysia Year 2007, Korean visitors' arrivals totaled 224,000, up 18.7 percent from a year earlier. "We aim at attracting 280,000 Korean tourists this year,"he said. Mr.Zawawi made these and other points when he met with members of the Friends of Malaysia Club in Korea on March 3 at Hotel Lotte in Seoul . On hand at the friendly get-together were Mr. Mohd Amirul Rizal, newly appointed director of Malaysia Tourism Promotion Board (MTPB) Korea , Ms Kausar Kassim, deputy director of North-East Asia Division of MTPB and Jeffrey J.Bruyns, group director-sales & marketing of YTL Hotels & Properties of Malaysia..
Mr. Jon Kim, co-chairman of the Friends of Malaysia Club in Korea extended his warm welcome to visiting MTPB officials and pledged to do his utmost effort in his capacity as Korea-side chairman of the club to promote the friendship between Korea and Malaysia . Kim, who is concurrently vice chairman of the Korea Tourism Association, also promised to help support Tourism Malaysia to attract Korean tourists to Malaysia. 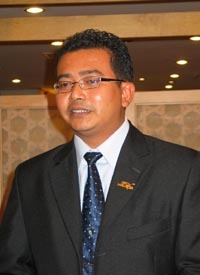 Mr. Mohd Amirul Rizal, newly appointed director of Malaysia Tourism Promotion Board (MTPB) Korea. Kim expressed his keen interest in "Malaysia My Second Home Program" aimed at retirees from Korea , Japan and elsewhere in the world and suggested Mr. Zawawi to work together for increase of flight frequencies between Korea and Malaysia for promotion of two-way tourist traffic as well as upgrading tourism infrastructures to the satisfaction of visitors of the two countries. Tourist arrivals hit 20.97 million mark in 2007, surpassing the 20.1 million target set by Tourism Malaysia and brought in total revenue of RM46.1 billion. The tourist arrivals for 2007, which coincided with Visit Malaysia Year 2007, represented an increase of 19.5 percent compared with 2006. Singapore remained the top market with 10.49 million tourists, followed by Indonesia (1.80 million), Thailand (1.62 million), Brunei (1.17 million), China (689,293), India (422,452), Japan (367,567), the Philippines (327,140), Australia (302,363) and Britain (276,213). Korean tourist arrivals totaled 224,000, up 18.7 percent from a year earlier. In the meantime, Mr. Mohd Amirul Rizal, newly appointed director of MTPB Seoul, joined the Tourism Malaysia in 2001 and has since worked as director for Tourism Malaysia Terengganu before taking over the Seoul post effective on March 1 to succeed Mutalib Awang who is scheduled to leave here at the end of March after wrapping up his tour of duty in Korea. Mr. Mohd Amirul Rizal was one of key members behind the successful participation of Malaysia in EXPO Aichi 2005 held in Nagoya, Japan. Among other major work experience of Mr. Rizal includes "Malaysia branding efforts" in Frankfurt, London, and Berlin, to name just a few. More recently, he was responsible for organizing the Committee for Visit Terengganu Year 2008. He is married with two daughters.